The Community Farm at Five Points MARTA station, aka the Five Points Farm, was established in 2016 thanks to a partnership between Central Atlanta Progress and the Atlanta Downtown Improvement District (CAP/ADID) and MARTA. 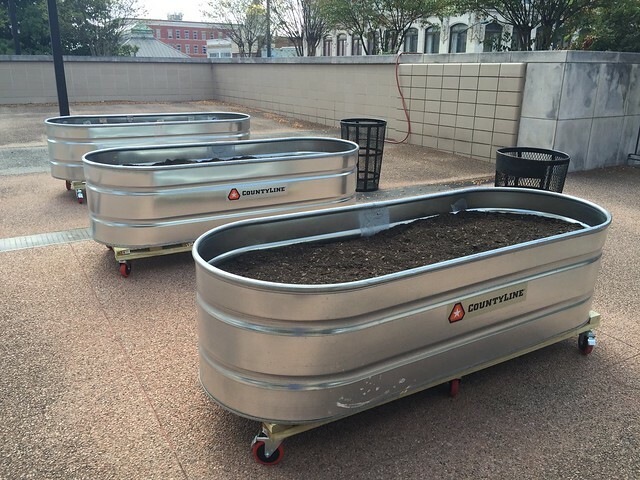 In spring 2018, we’ve partnered with the City of Atlanta’s Office of Resilience and many others to expand the farm and make it an even better amenity for the Downtown community. A facet of the Five Points MARTA Makeover Project, the Farm is one of many tactics that aims to enhance the station with regular community programming and a positive experience for MARTA patrons. Where exactly is Five Points Farm located? The farm is located on the upper plaza level of the station, across from the Station Soccer pitch. How can I get involved at Five Points Farm? Farm plots are open to all interested parties. Participants much acknowledge and comply with the 2019-2020 Five Points Farm Participant Agreement, and maintain current membership dues. Dues for the garden vary based on plot size and plots are limited and first-come, first serve. How big is a farm plot? Plots are assigned on a first come first serve on an annual basis annually with renewals available each year. The plant list for the garden is seasonal and subject to the natural growing conditions. Most legal and non-invasive plants are permitted. When can I access the farm? The Farm hours are 7:00 a.m. - 8:00 p.m. Monday through Friday and 9:00 a.m. - 6:00 p.m. Saturday and Sunday. Being a Downtown resident is not a requirement. Whether you live here, work here, go to school here, ride MARTA, or are just interested in the project, we welcome your involvement. How do I get to know my fellow farmers? Once you are approved for a plot, we will invite you to our Facebook group, where you can connect with your fellow Five Points Farmers. Thank you to our Five Points Farm community partners: MARTA, Aglanta, ADNA, City of Atlanta Office of Resilience, Food Well Alliance, Georgia Municipal Association, Greening Youth Foundation, and Urban Sprout Farms, and CAP/ADID.